I should imagine the most convenient place to be living, in order to complete the 92 would perhaps be somewhere like Tamworth, once described by Julian Cope as “in the middle of England”. The business being rather more of a challenge geographically speaking, if one resides in Cornwall or Cumbria, say. So spare an occasional thought for a sad obsessive like myself attempting to complete the job based in a completely different country: to whit Caledonia. Perusing a map and contemplating all those Football League clubs strung along the south coast of the island has my heart sinking. So, onto a trip to Lords cricket ground, was tagged this 115 mile southwestern scurry to take advantage of a rare opportunity to tick-off AFC Bournemouth. Particularly rare, when one considers that Bournemouth’s Vitality Stadium is by some way the smallest ground (capacity wise) in the English Premiership. So, outside of pre-season friendlies and occasional cup ties, tickets to the place were likely to be at a premium at least for the coming season. It’s a neat little ground, with the open comers kept to an absolute minimum, but it does appear just a touch modest to be hosting Premier League football. The good folks of Bournemouth, or at least a few pockets of them behind the goals, did attempt to generate some atmosphere this evening. But generally found themselves outgunned by the chattering classes in the main stands. I was slightly surprised that only 8,000 or so home fans had been tempted out to attend a friendly with such high-profile opponents, but I am guessing most would have already forked out a not inconsiderable sum for their upcoming season tickets. That a club of Valencia’s pedigree could be enticed to visit the Vitality Stadium would I am sure by some be regarded as a major coup. Although, when I think about it, given Bournemouth’s access to Sky and BT Sport’s squillions, one could have a fair old debate over which is the “bigger” club these days. Home 'keeper Artur Boric had a bit of a flap at this free-kick, and was relieved to see the rebound headed over. ...and it was admittedly fun seeing some attempts from folks who could barely walk straight. Lots of neat possession football, as may have been expected, from the Spanish side but not too much in the way of penetration. Both Enzo Perez, and whoever was playing number 9 were big, strong lads who could also play a bit - and PEREZ it was who opened the scoring after 39 minutes, selling his marker a delightful dummy before hammering past Artur Boric. Nani, whom I had seen twice at Euro16 in the summer, I knew had recently signed for Valencia, but of the Portugal star there was no sign. For the home lot, on-loan Chelsea midfielder Jason Ake looked an accomplished individual, whilst both Max Gradel and Jordan Ibe beavered away tirelessly. Centre-forward Benik AFOBE was less effective, although he did succeed in hitting his side’s equaliser just after the hour mark. Following this strike the home support for a spell stopped their gossiping and got behind their side, but within 15 minutes or so, the on-field action was once again being played to background thrum of inane chat-chat-chatter. The route to the Vitality Stadium crosses what looks like a cricket pitch. Certainly the building (presently a cafe), has a cricket pavilion look to it. When discovering I was well over halfway to collecting the 92, a friend asked me what I was going to do after that. 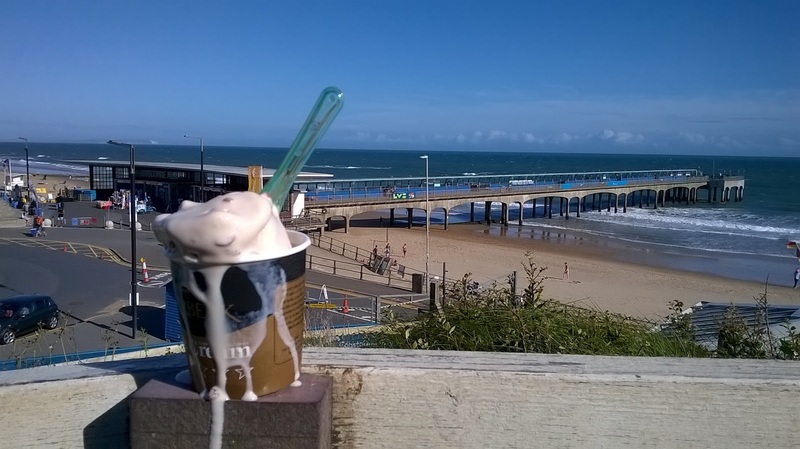 Why, to buy an ice-cream at all the piers in the UK, of course. To this end I made a start before the Bournemouth match, by purchasing just one such from Boscombe Pier. Nice Post, I like all the pictures you shared. All the pictures are beautiful, the Vitality stadium is really amazing. Thanks for sharing this post with us.